For many patients with low levels of mobility, a pressure relief cushion may be necessary to reduce the risk of pressure sore development after long periods of time sitting down. The Systam Gel Pressure Relief Cushion is constructed from viscoelastic gel that provides extreme adaptability and elasticity. This enables the cushion to act as a second skin, which continually ensures perfect contour moulding to the sacral area and eliminates friction when sitting. 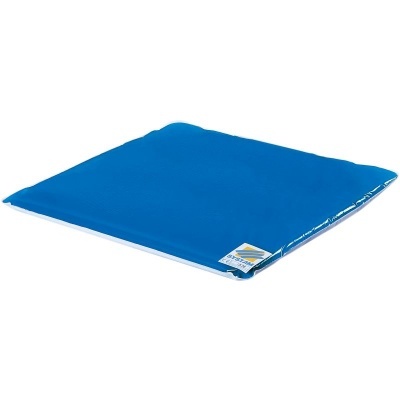 This cushion is suitable for users at low to medium risk of pressure sore development, and is available in two sizes to suit a range of different users and environments. Please select your desired option using the drop-down menu above. This gel cushion has been designed to work as an enhancement to existing surfaces, boosting comfort without sacrificing the user's sitting posture. Increased pressure distribution makes this a simple and efficient way to prevent pressure sores, as it is suitable for a wide range of seating types including wheelchairs and lounge chairs. This cushion is not recommended for use on especially hard surfaces. The Systam Gel Pressure Relief Cushion spreads the load of the user's weight to create a powerful pressure relieving effect. The image below demonstrates the efficacy of this cushion. 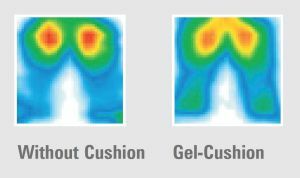 As you can see, the image without the cushion demonstrates high pressure areas on the skin beneath each buttock (the deep red circles). With the Systam Gel Pressure Relief Cushion in place, the pressure on the bottom is more evenly distributed across a far wider surface area (the orange and yellow zones). This distribution significantly reduces the pressure on areas at highest risk of developing pressure sores. 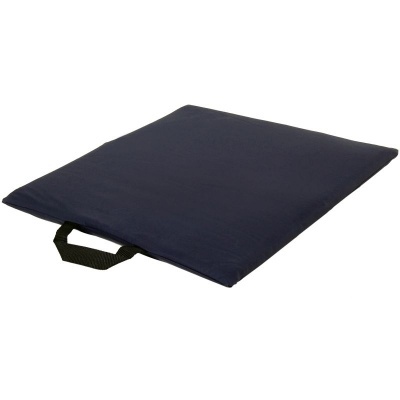 This pressure sore cushion is supplied complete with a discreet cover with integrated carry handle for ease of transportation. The cover is waterproof, protecting the cushion while remaining breathable and vapour permeable. This combination of features allows the cushion to stay hygienic while maintaining a high level of airflow, cooling the user and preventing overheating and perspiration. Pollymaille Cover: A hypoallergenic polyurethane enduction cover (antibacterial, anti-germ and anti-fungal). This cover is two-way stretch ensure comfort for the user and reduce shear forces, and features a zip that covers 3 sides and a non-slip base. Polymaille HD Cover: All the features of the Polymaille Cover with welded seams for increased resistance to fluid ingress.